Want a fish tale of your own? 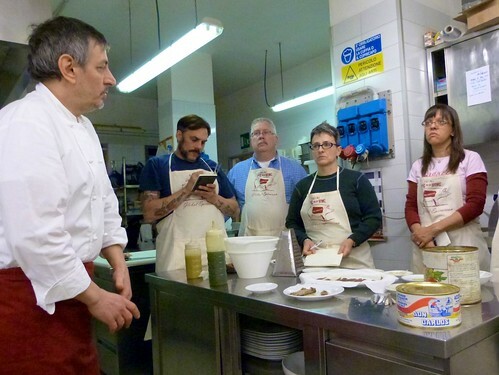 Join us in Emilia-Romagna for a culinary tour of the region, with hands-on foodcraft classes and more. 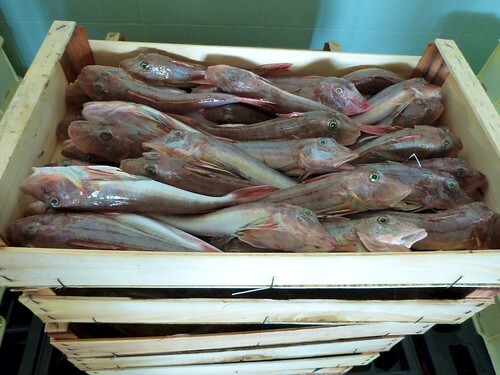 I know you're supposed to have fish on Friday, but our Tuesday was all about the marvelous harvest of the Adriatic sea. 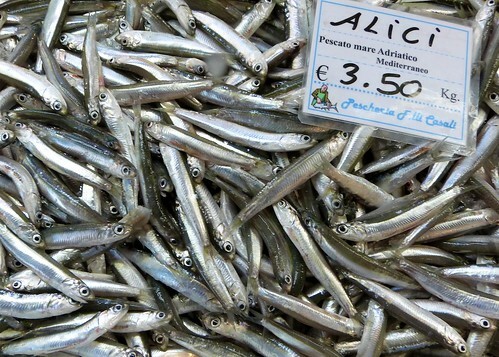 We started our day with a trip to Cesenatico's pescheria, along the da Vinci-designed waterfront to see some of the varieties of local fish, like fresh anchovies (pictured, above), branzino and one of the most prized local specialties, grey mantis shrimp, or canocchie. These little fellas have long tails with wide, flat tailfins that have black "eyes" and a flash of almost electric blue along the ridge. Just outside, we visited one of the conserve, brick-lined pits once used for preserving fish before the advent of refrigeration. Fish would be laid into the pit, layered with ice, and covered. During leaner times, they could dip into the reserves and enjoy still-fresh fish. Needless to say, by now we had built up an appetite for seafood. For lunch we descended upon Ristorante San Marco, just catercorner from the pescheria. San Marco is a fairly rustic, straightforward kind of place where they serve just seafood, and plenty of it, simply prepared. We enjoyed the aforementioned canocchie baked in a salt crust of salina camillone di Romagna, sea salt hand-harvested from neighboring Cervia, where the mineral content of the water lends a faintly sweet flavor. Known locally as sale dolce (sweet salt), the finer grade salfiore is also known as sale dei papi, as it was originally reserved for the popes. The salt crust trapped in moisture, keeping the canocchie tender and sweet. We also enjoyed heaping bowls of tiny, super-flavorful vongole, clams bursting with their briny broth. Sorry, no pictures -- we were too busy eating. After, several of us took a traghetto across the harbor to visit the wholesale fish market. The day's catch was just beginning to come in, like flats of triglie, or mullet. 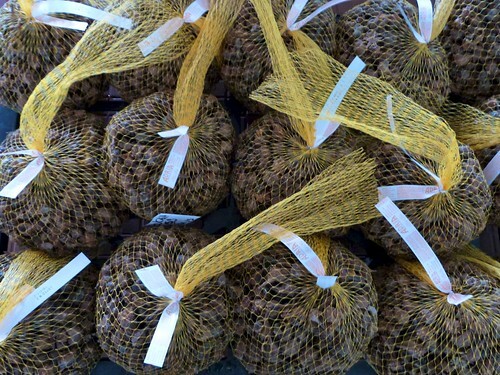 And bags of various shellfish, like what appeared to be some kind of whelk. 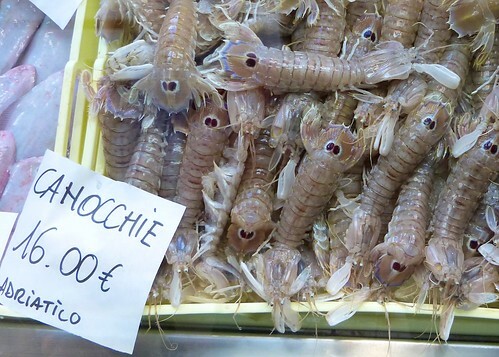 Cesenatico's market operates a little differently than many others. The fish are sold at auction, but it's what's known as a reverse Dutch auction. 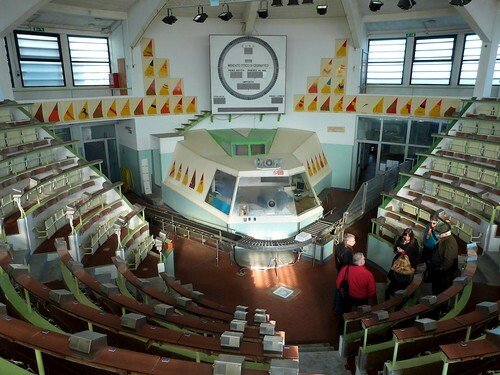 The fish is brought out on a conveyor belt, and bidding begins with a high price. The price steadily drops until the first nabs it at the price they want. The auctioneer calls the shots from his booth, resembling a ship's prow. The fishing families' flags adorn the auction house. Had we come later, we would have been able to see the actual auction. But we had to head back to the Hotel Sirena, where chef Roberto DellaPasqua was awaiting us in the kitchen to teach us a few methods of preparing Adriatic fish. He pulled out a can of anchovies he cured himself. 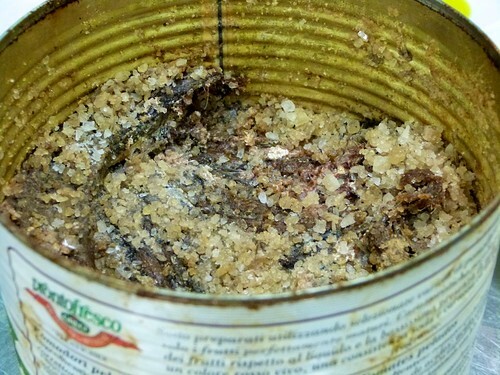 Ingredients: empty can, anchovies, coarse salt. Basta. 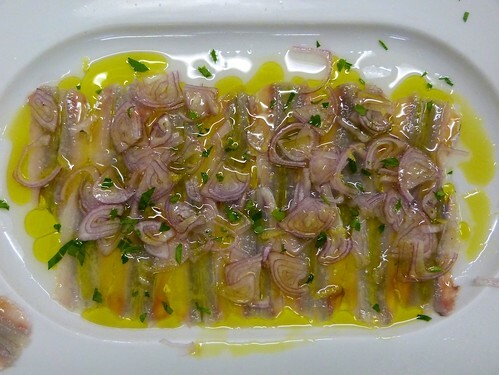 Anchovies were the highlight of the class, as Roberto showed us how to lightly marinate them in vinegar, which plumps the flesh and enhances the color of the skin. 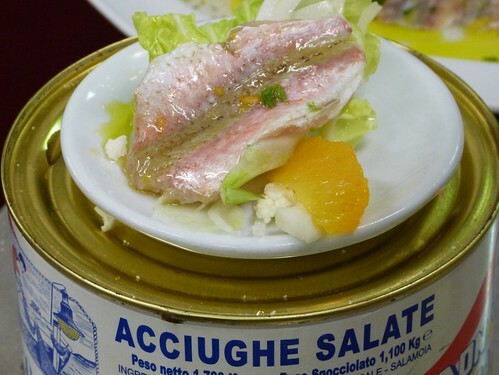 This alone makes a lovely little bite, especially with a little lettuce and citrus. For dinner, guess what? Fish! We headed into town to Osteria del Gran Fritto for their fritto misto, featuring yet more fresh fish from the Adriatic. See the other posts from the trip to Italy, January 2012.